Another option if you don’t want to use paid search or wait for your SEO efforts to take hold then you might try building up a referral business from other attorneys via LinkedIn. We have an automated solution which can put your business in front of at least 1500 attorneys a month who have not seen your business. We are also seeing fabulous results for bankruptcy attorneys, family law attorneys, and pharmaceutical liability/medical device liability law firms. Surprisingly, we have seen some clients do better with personal injury type keywords while other clients seem to do better with auto accident keyword sets. It is a mystery as to why some of these keyword sets work better for different clients. It could be different levels of competition in those cities. It may make sense to run different campaigns for the different types of keywords and track them separately. This is something that we do for our clients who hire us to manage their AdWords accounts. Are you tracking average call length for your AdWords and SEO calls? If not, you should. Our average call lengths for this practice area are usually over 6 minutes and many weeks over 8 minutes. Cheap leads are great…but affordable quality leads that convert into big cases are even better. You can setup call tracking and test average call length by signing up at CallRail.com You’ll also see if your intake specialists are doing their job. On this page you can see towards the bottom of the page some of the minute details about keyword quality you are able to track using CallRail. While that page is about a different practice area you will still get the idea of what is possible with call tracking. If you also have other practice areas you should take a look at our page geared towards bankruptcy attorneys. 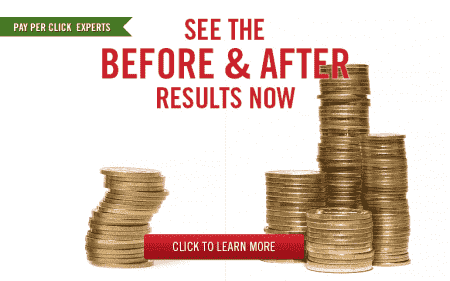 Often we can generate leads for bankruptcy attorneys at or under $50 per lead. and we also have a page which shows the results we have achieved for family law attorneys (about $30-$80 per lead). Of course, you also have to keep in mind that although clicks are important, conversions are what truly matter in the end. Here are some results we achieved in late 2016/early 2017 for personal injury/auto accidents in a small city using a budget of $3000-$5000 per month. The cost per lead (CPL) is the cost to receive one contact form submission or phone call. 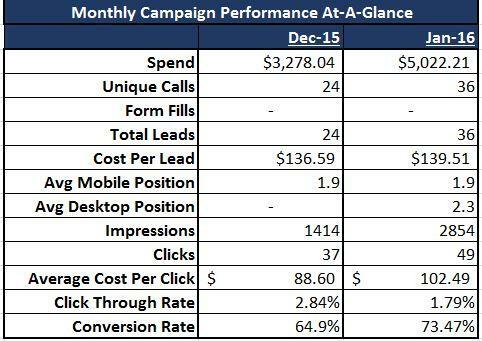 These numbers are old and the cost per lead is higher now. And here is the breakdown week by week for what we achieved using these keywords for another client in a more competitive city. Keep in mind that if you target click to call only you may see a better cost per conversion although the volume will be lower. On your responsive or mobile only landing pages (or, better yet, your AMP or accelerated mobile pages) you should definitely have image and text links to drive calls. This trick will make a big difference with your conversion rate. And if you still aren’t seeing a sub-$200 cost per conversion then you should definitely call us at 800-645-9521 so we can step in and fix your AdWords account. Why are we willing to share this information? Because in the world of PPC advertising, there’s more to it than just the keywords. Although the keywords play a very important part, it is the overall strategy on how these keywords are used that can make or break the campaign. What do these strategies involve? It’s a mix of your keywords, ads, negative keywords and landing page. And targeting the right balance of traffic between mobile and desktop as well as choosing the right strategy to push live calls. Using the right approach for each of these aspects is the final ingredient that makes your PPC campaigns as successful as possible. Getting everything right is especially important for Personal Injury PPC advertising campaigns because it is a highly competitive vertical. Considering the high level of competition and the high price you’ll pay per click for personal injury PPC advertising, it is even more essential to get things right from the start. You have the best keywords that have been proven to be effective in PPC campaigns. Now, it’s time for you to start making good use of them by coming up with a comprehensive keyword list for your personal injury PPC campaign. Think about how you can pair up your personal injury or car accident keywords with effective keywords related to attorney, lawyer, law firm or lawsuit. This process is called keyword iteration. Through this step, you can widen your reach and immediately tap into related keywords that the same audiences could be looking for. Create modified broad, phrase, and exact match type versions of all the keywords. You can also run broad match keywords, but you may need to use a broad match modifier “+” injury or “+” serious injury in your keywords so that you can ensure these terms are included in the queries your ads show for. Of course, you also have to keep in mind that you would need a comprehensive negative keyword list to help you keep your ads from showing and getting clicks from unrelated searches. For example, you want to add negatives to avoid showing ads to people searching for information about accidents in the news, or car accident photos, or new attorneys looking for car accident attorney jobs. Keep in mind that car accidents are described using different terms throughout the country. Some may call it a car wreck, while others would call it as a car crash. Make sure you use the right terms for your area. You can also clone all of these keywords for motorcycle accident, pedestrian accident, truck accident and 18 wheeler accident, or other types of injuries you’re interested in targeting. So you’ve built a comprehensive keyword catalog. Next, you’ll need to write some great personal injury ad text. One thing that you have to remember is that you can only use one exclamation point in each ad.